This is a disastrous four-letter word. My entire childhood this color haunted me, taunted me. Poofy dresses. Socks with laces. Shoes with bows. Hair clips. Hair pins. Hair accessories galore. Apparently in my family, in my building, in my ten-block radius, girls were to be dressed in pink. Pink. Ugh … the thought of it gave me a rash. I don’t know where they got it from. I don’t know who said that prancing around in this tragic red and white mixture made you more of a girl. Blue. Green. These were awesome colors. Colors that made me feel comfortable. Colors that brought a smile to my face. But apparently they were “meant” for boys. What the hell? Blue was blue, and green was green. They didn’t belong to anybody. 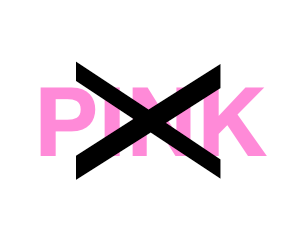 Pink didn’t belong to girls either, but apparently they staked claim on it. And pink had become the “girly-girl” color while I was growing up. Being a tomboy, made it easy not to be one of the girly-girls. But apparently my wardrobe needed pink. My mom, my aunts, and my cousins made sure of that. And no matter all the “Wow, how beautiful that looks on you…wow that’s your color,” comments they never convinced me. I hated pink. I hated that just because I was girl I was told to wear it. I hated how it looked, and how it felt. I hated the brightness of it, although I didn’t mind yellow and that seemed pretty bright. I mean the sun was yellow. So I guess it had nothing to do with brightness, it was just the color itself. Pink … it was the color of Pepto Bismol for crying out loud. Who wants to wear Pepto Bismol to school. I sure didn’t. I mean I didn’t care if everyone else wore it, all I knew was that I didn’t to wear it. I didn’t want to be seen shooting hoops in that color. It just wasn’t me, but no matter all the protests, all the accidental losses, and all the bleach incidents that made those clothes “disappear,” a whole new cycle of clothes made their way into my closet during birthdays and Christmases. I vowed once I got older and earned my own money I would never buy anything pink. Not even if it had a pink tag. I just couldn’t do it to myself. And I didn’t. I got rid of it with extreme prejudice and it no longer occupied my closet. Flash forward to 2011 … my daughter is born. It was the return of the Pink Attack. Had people forgotten who I was? No. Had they forgotten that I specifically told them absolutely no pink, not on buttons, not on zippers, and most definitely not anywhere on the Carter’s or OshKosh clothing they wanted to give me? No. Had they forgotten that I said I didn’t care if it was on sale? No. Had they forgotten that my idea of cute was different from theirs? No. The Pink Attack was back. But I did what any crazy person would, I returned the clothes and came back with greens, whites, purples, or yellows. No pink in sight. Apparently to some people, that made me jackass, but I just thought I was being myself. No need to be hating on the Guat because she hates pink. They knew it. They pretended not to, or thought I would magically change because I had a girl … dude no magic strong enough for that one. Apparently this move seemed to stop the pink attack, momentarily. Every now and then it resurfaces, but I think we all know who what happens to pink when it tries to make its way into the Guat closet. And when my daughter gets older, and if she tells me that she hates blue, or red, or purple or yellow. I’m gonna listen. If she says she likes pink … I’m gonna have to get some chocolate for that one. Lots of it. Ha! Good luck shielding your daughter from the pink :). Ahhhhhhhhhhhh…I’m trying. But family doesn’t help me out. A true rebel … like James Dean. Before we had children my girlfriend and I decided no way were we going to put our children in pink. Those mums who forced their poor little kiddies to wear that colour were doing it only to satsify some perverted need of their own. It was criminal. She had daughters, they wore pink for the first few years, I had sons. Yeah…I’m in the “others” category 🙂 Thanks for stopping by.